We've launched our new app. 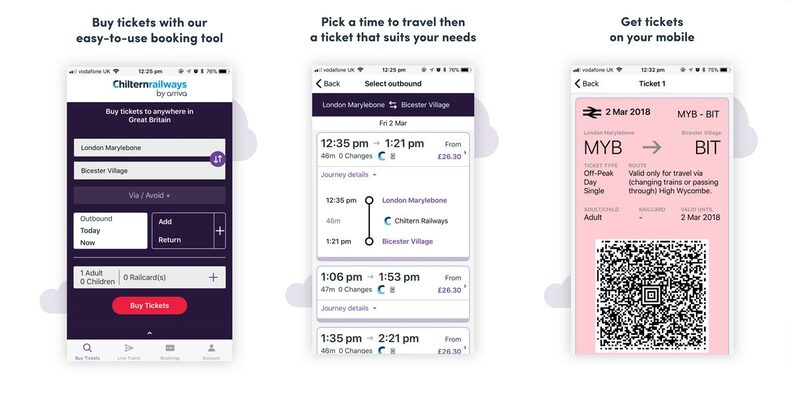 We’ve upgraded our app to make journey planning, accessing the latest travel information and buying your tickets even easier. Clearer, simpler and quicker-to-use, the new Chiltern app is packed with helpful features – available for you to download now using the buttons above. When you buy tickets through our app, we’ll never charge you a credit card, debit card or booking fee. We've got many more Chiltern journeys available with e-tickets to download straight to your phone. We will always show you the cheapest fare for your journey. So, breeze through our stations with your e-ticket on your app, and hello cheapest Chiltern fares around! Cheapest fare indicator - We’ll always display the best value fare first, to help your money go that little bit further. Save your preferences - To make booking your next journey quicker and easier, you can set up an account – saving your favourite journeys and seat preferences. Full access to ‘my account’. No need to visit our desktop or mobile sites to make changes. Groupsave discount - This will be automatically applied, so you’ll always get the best value. Access -You’ll be able to log in to our new app in exactly the same way as before, using an email address and password. If you are an existing customer of the old app please go to www.chilternrailways.co.uk/new-chiltern-app for more detail on existing bookings.